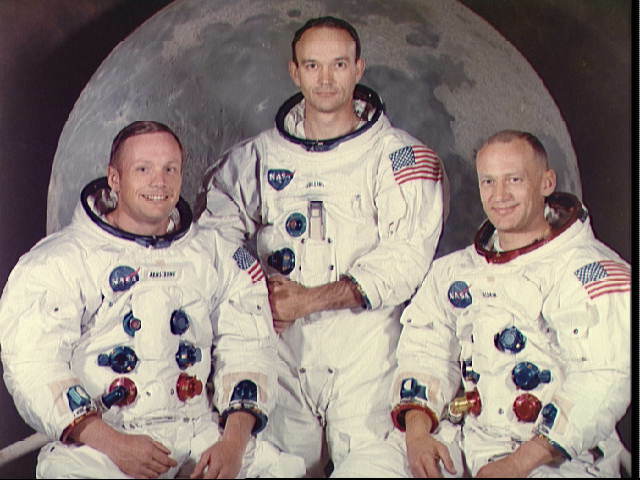 The crew of Apollo 11: Commander Neil A. Armstrong, Command Module pilot Michael Collins, Lunar Module pilot Edwin E. Aldrin, Jr. May 1, 1969. 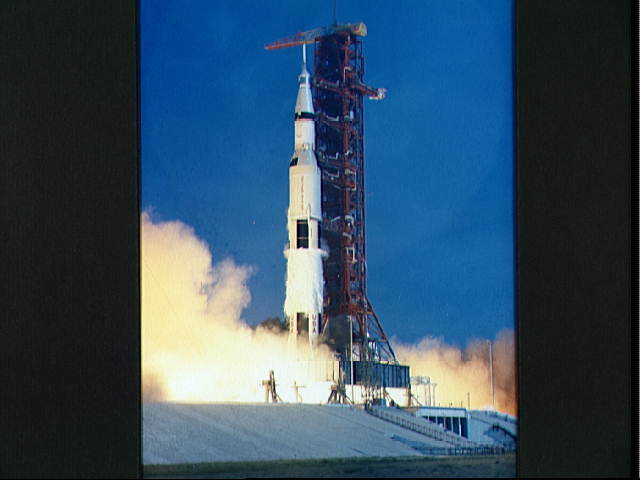 The first manned journey to the Moon began at Pad A, Launch Complex 39, Kennedy Space Center, Florida with the liftoff of Apollo 11 at 9:32 a.m. EDT on July 16, 1969. 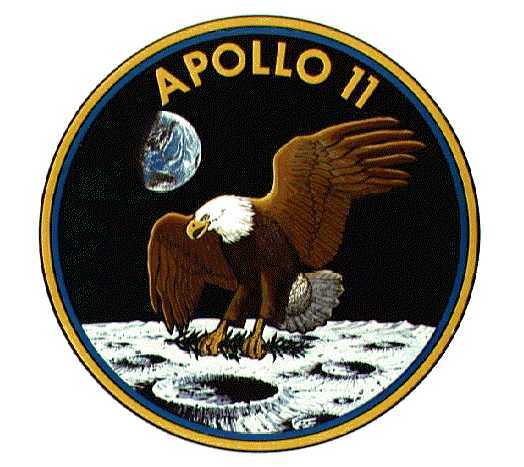 The Apollo spacecraft reached Earth parking orbit after 11 minutes. After one and a half orbits the Saturn thrusters fired and the astronauts began their journey to the Moon. 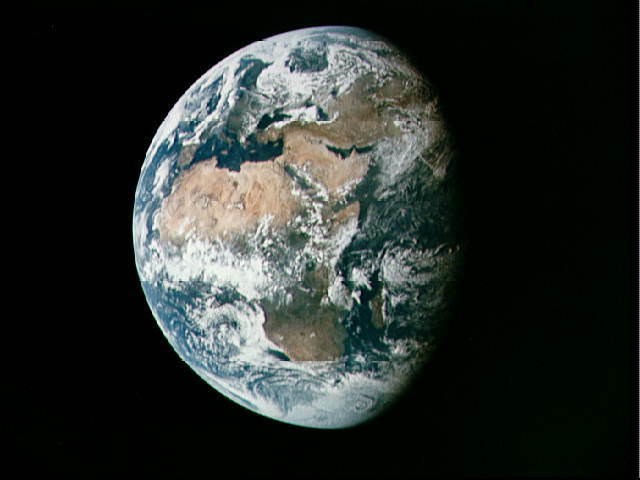 This spectacular photo of the Earth was taken from 98,000 miles during the Apollo 11 translunar injection on July 16. Most of Africa and parts of Europe and Asia are visible. This west-looking image of the landing site in the southwestern Sea of Tranquility was taken from the Lunar Module (LM) one orbit before descent, while still docked to the Command Module (CM). The Tranquility base site is near the shadow line, just to the right of center. The large crater at the lower right is Maskelyne. The large black object in the lower left is not a shadow but a LM thruster. 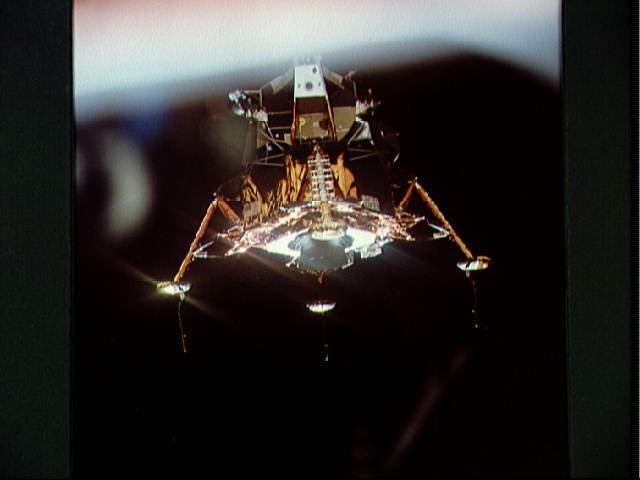 At 1:47 pm EDT, July 20, the Lunar Module "Eagle" carrying Neil Armstrong and Edwin Aldrin, separated from the Command Module "Columbia". 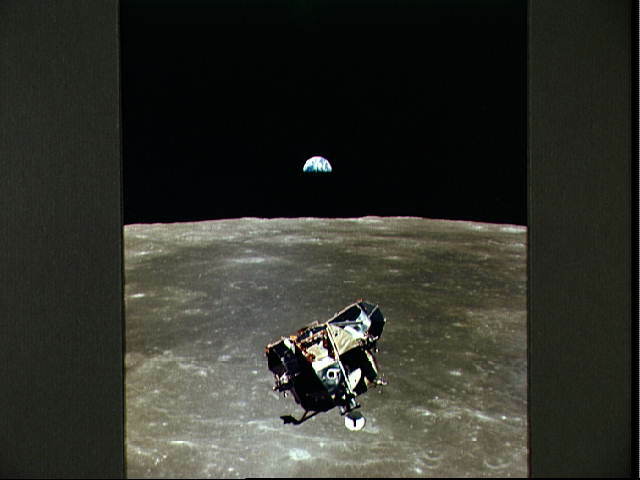 Michael Collins, aboard the CM, took this picture of the LM as it prepared for its descent to the lunar surface. "You cats take it easy on the lunar surface", Collins said as he released the LM. The lunar horizon can be seen in the background. 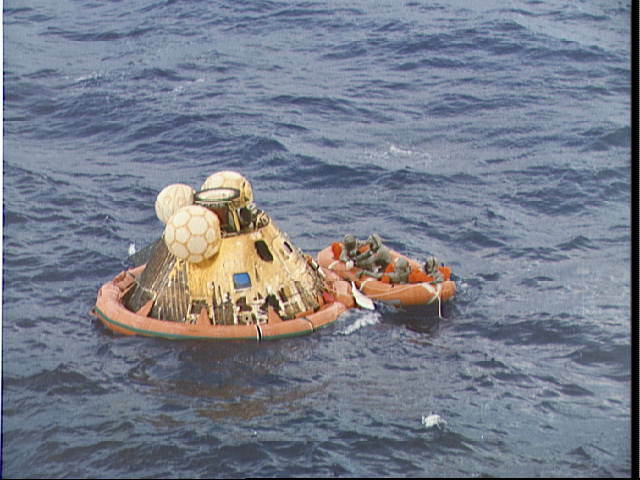 This photograph of the Command Module was taken from the LM after separation. The lunar surface below is in the north central Sea of Fertility, centered at 51 degree east longitude, 1 degree north latitude. Over the next day, Michael Collins would orbit the Moon while his colleagues walked on its surface. "Houston, Tranquility Base here. The Eagle has landed." These words ushered in a new era of human exploration at 4:18 pm EDT on July 20, as the first manned flight to the Moon touched down. 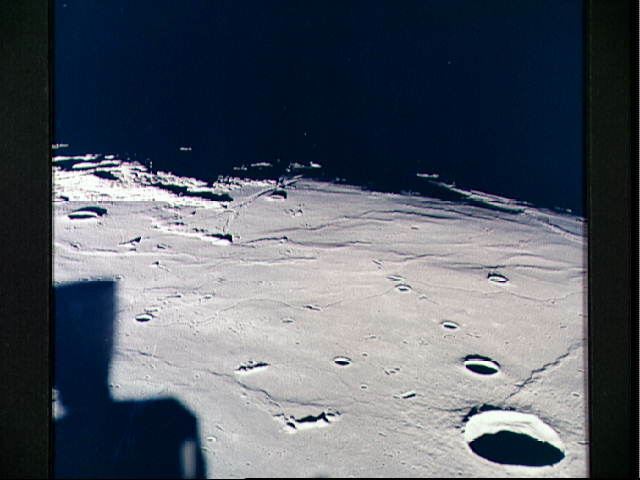 This picture, taken from the LM window shortly before touchdown, shows the surface of the Moon near the touchdown point in the Sea of Tranquility. "Magnificent desolation", Aldrin called it. "That's one small step for man, one giant leap for mankind." 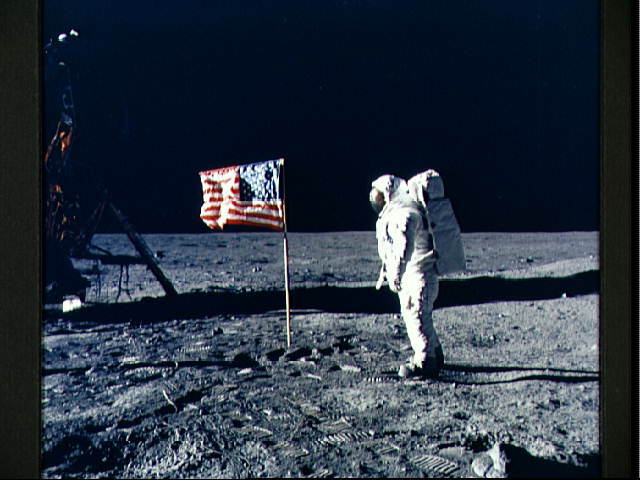 At 10:56 pm EDT on July 20, 1969, Neil Armstrong became the first human to set foot on the Moon. This image was taken from the telecast of the event, watched by people around the world. 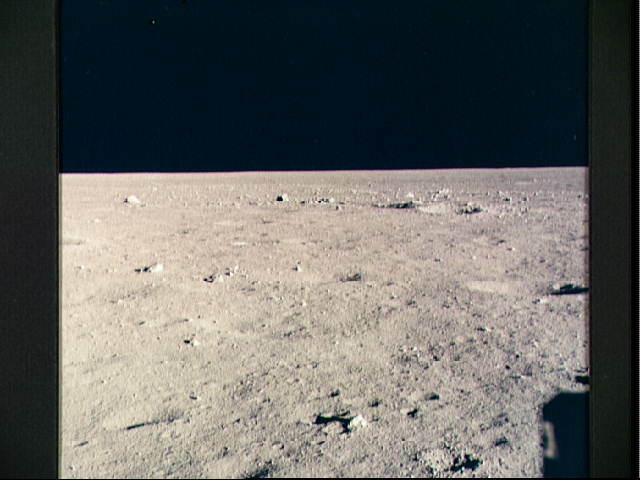 The pictures were taken by the Apollo lunar surface camera, the black bar running through the center of the picture is an anomaly in the Goldstone ground data system. 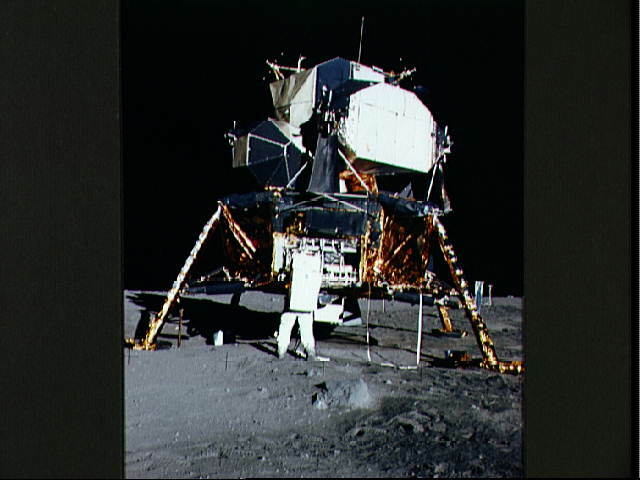 Aldrin joined Armstrong on the surface less than fifteen minutes later, in this photo taken by Armstrong. 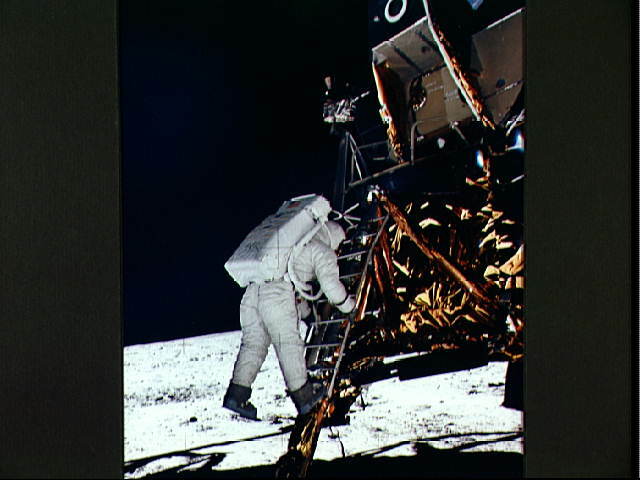 As he left the LM, Aldrin said, "Now I want to partially close the hatch, making sure not to lock it on my way out." "A good thought." replied Armstrong. 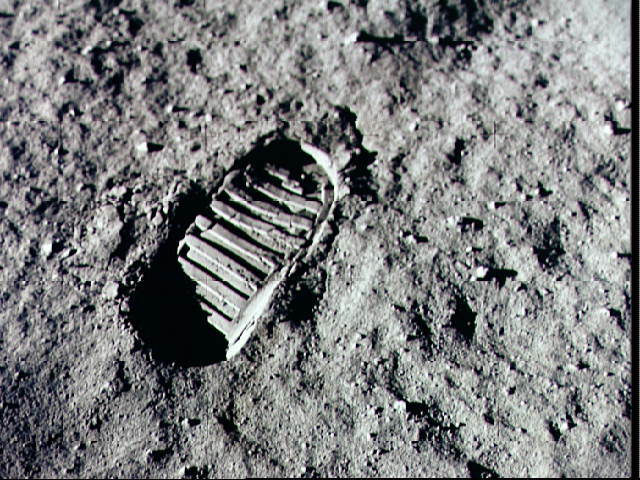 The footprints left by the astronauts in the Sea of Tranquility are more permanent than many solid structures on Earth. Barring a chance meteorite impact, these impressions in the lunar soil will probably last for millions of years. A view of the Lunar Module "Eagle" on the Moon. Aldrin is opening the stowage area and preparing to unload the scientific experiments package. Beyond the right leg is the solar wind experiment, and beyond that the lunar surface TV camera. In the few hours that Aldrin and Armstrong were on the Moon, there was little time to set up scientific experiments, but a small package (the EASEP, or Early Apollo Scientific Experiments Package) was deployed. 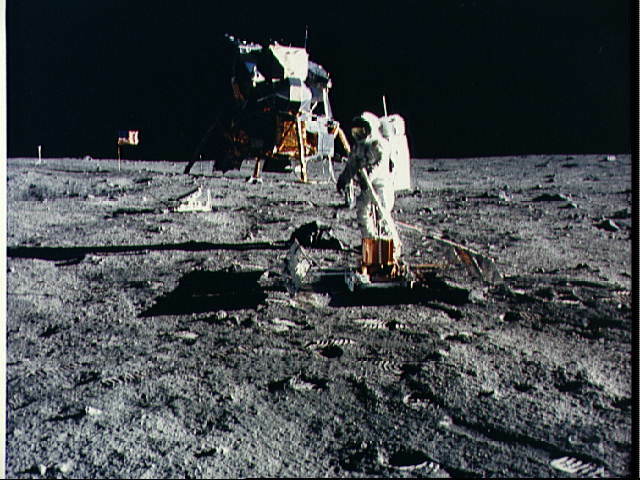 Aldrin is shown here setting up the Passive Seismic Experiments Package. Back to the left is the Laser Ranging Retro-Reflector. More extensive scientific studies were done on later Apollo missions. Millions of Earthlings watched the drama unfold on TV images taken by the black and white lunar surface camera. Here, Armstrong is standing in the center, and Aldrin, a colonel in the Air Force, is saluting President Richard M. Nixon, who had just spoken to the two astronauts by radio. Neil Armstrong took this picture of Edwin Aldrin, showing a reflection in Aldrins visor of Armstrong and the Lunar Module. 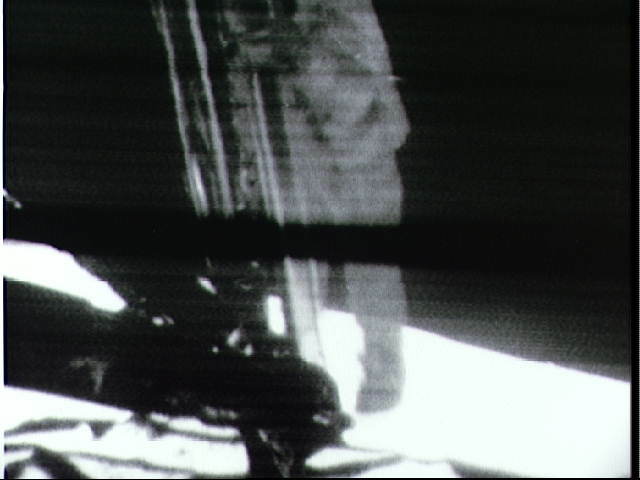 This is one of the only photographs showing Armstrong, who carried the camera, on the Moon. 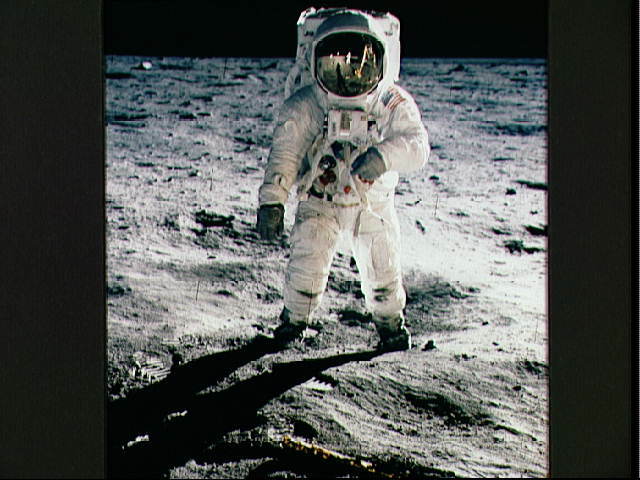 Aldrin later said, "My fault, perhaps, but we had never simulated this in training." The astronauts returned to the Lunar Module after 2 hours and 32 minutes on the surface (2:15 for Aldrin) and took this picture. 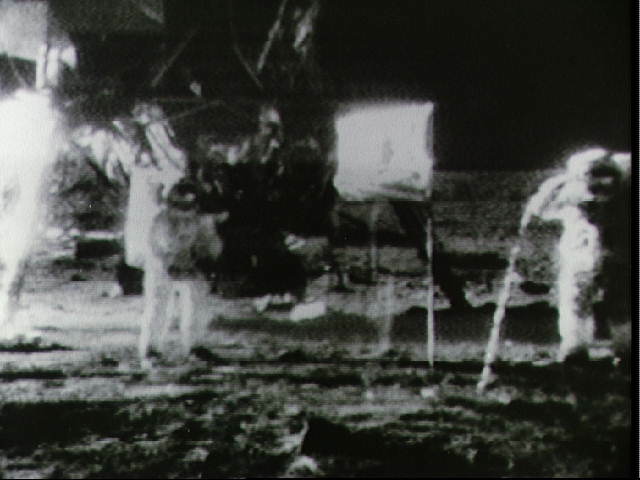 The footprints of the astronauts and the lunar surface television camera can be seen. 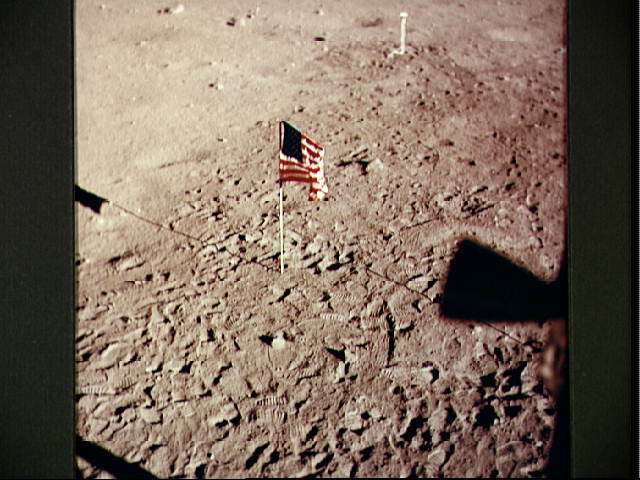 The flag had been difficult to set up, and was actually knocked over when the LM took off from the Moon 21 hours after landing. 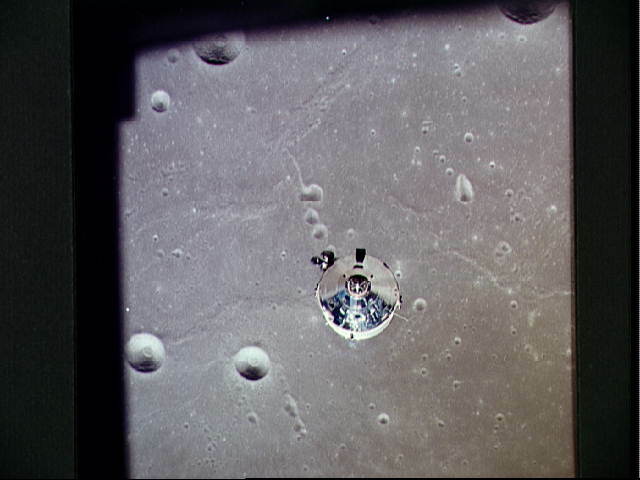 After lifting off from the lunar surface, the LM made its rendezvous with the Command Module. 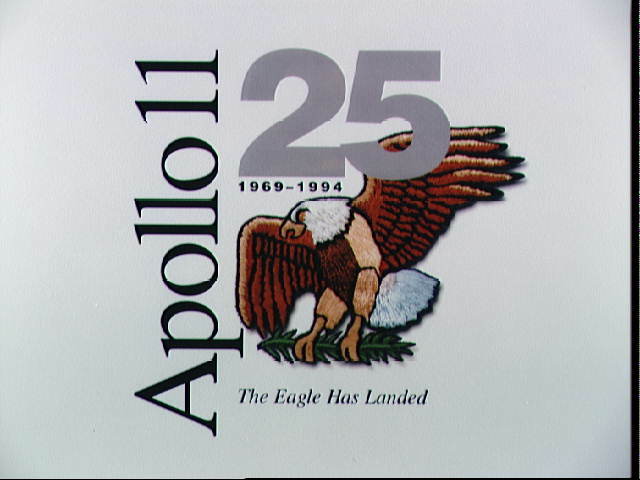 The Eagle docked with the Command Module, and the lunar samples were brought aboard. 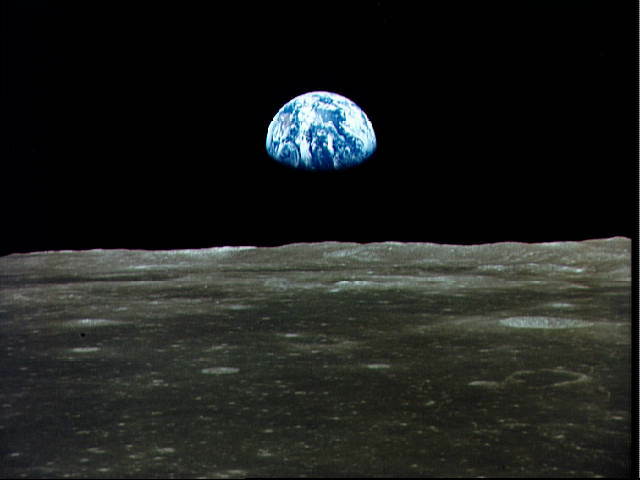 The LM was left behind in lunar orbit while the 3 astronauts returned in the Columbia to the blue planet in the background. The final phase of Kennedy's challenge was completed at 12:50 p.m. EDT on July 24, 1969, when the Columbia splashed down about 812 nautical miles southwest of Hawaii, returning the 3 astronauts safely to Earth. Here they are shown in a life raft with a Navy frogman. All four men are wearing biological isolation garments, awaiting helicopter pickup and transport to the U.S.S. Hornet. The day before splashdown, Aldrin said, "We feel this stands as a symbol of the insatiable curiousity of all mankind to explore the unknown."